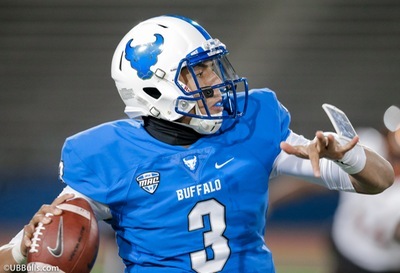 The 2018 season could be magical and memorable for the UB Bulls football team. Now we know how the expectations will match up with the reality of who the Bulls will have to beat, and when. The school and Mid-American Conference released the dates and the opponents for next season. We already knew the Bulls non-conference slate. Now the MAC opponents and the dates have been pinned down. It’s a challenging lineup that puts the Bulls on the road against conference powers Toledo, Central Michigan & Ohio. The Bulls get an unusual September conference home game against Eastern Michigan, in a game that could set the tone for October & November. UB fans will have to plan for a pair of Tuesday night home games, while the Blue & White end the regular season with a Wednesday night MACtion game at Ohio and at Bowling Green the day after Thanksgiving. The reasons for optimism about 2018 are obvious. The team returns four of their five All-MAC players, including nationally ranked performers WR Anthony Johnson and LB Khailil Hodge. All three quarterbacks return, including emerging star Tyree Jackson. Every running back who carried the ball is back, as are five of the top six players who caught passes. The biggest losses are on defense, where five starters need to be replaced. But Hodge, the nation’s 2nd leading tackler is back and so is second-leading sacker Chuck Harris. Overall, of the 24 starters from last year (offense, defense, specialists), 15 will suit up for 2018. The team finished up last season on a three game win streak, and just narrowly missed a bowl game at 6-6. 9/1 Delaware State: The Hornets from FCS were 2-9 last year, and should be a good way for the Bulls to start the season. 9/8 at Temple: This may be the toughest game on the schedule. The Owls were a bowl team last year and are always tough and competetive. The game will be played in the home of the Eagles, Lincoln Financial Field. 9/15 Eastern Michigan: A rare conference game in the first month of the season. The Eagles took a step back from a bowl trip in 2016, and lost their All-MAC quarterback. 9/22 at Rutgers: While a Big Team team, the Scarlet Knights were 4-8 last year with wins over an FCS team and lower level Big 10 teams Maryland, Illinois & Purdue. 9/29 Army: The Black Knights were 10-3 with a bowl win. But UB beat them in Buffalo two years ago, and lost at West Point last year 21-17 in a game UB should have won. 10/6 at Central Michigan: Always a tough team, especially in Mt. Pleasant, MI. The Chippewas were a bowl team last year, but are looking for a new quarterback. 10 /13 Akron: UB’s most frustrating loss last year. The Zips are defending MAC East champs, only to be routed in the MAC Championship and their bowl game. 10/20 at Toledo: This should be the game of the year in the MAC. The Rockets are the defending champs. They lose All-MAC quarterback Logan Woodside, but UT always reloads instead of rebuilds. 10/30 Miami: The first weeknight game, and a big divisisional showdown. The Red Hawks are building, and despite a step back in 2017, will battle the Bulls & Ohio for the division title. 11/6 Kent State: The Golden Flashes have hired a new coach from the up-tempo DIno Babers tree to try and find some consistent play at quarterback. 11/14 at Ohio: A Wednesday night game that will be on national TV, the Bulls will have to find a way to beat their division rival on the road, something they haven’t done since 2008. 11/23 at Bowling Green: The day after Thanksgiving, it’s a game against a team UB beat last year but one that is building and may be ready to rejoin the top of the division. Overall, the schedule is challenging for the Bulls. But if players like Jackson and Johnson continue to grow and emerge as legit NFL candidates, there is no game here that is impossible for the Bulls to win. That’s why, on the 10th anniversary of their only MAC Championship, the Bulls are legit contenders for another one.